For avid spelunkers, the most spectacular images in Armenia are underground, and with more than 10,000 caves throughout the country, Armenia aims to please to subterranean explorer. Caves are located in every region of the country, but the more interesting line river gorges (Amberd, Hrazdan, Debed, Arpi, Vorotan and Voghji are great places to start). 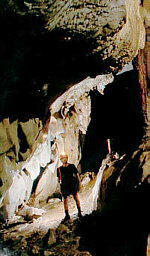 Vayots Dzor is the location of three caverns rated the best in Europe by members of the French Speleological Society. Magili, Archeri (Bear�s), and the smaller Jerovank cavern, provide hours of exploration. All three caves are located within a few kilometers of each other, with nearby camping at natural springs, under the boughs of an ancient apricot forest, or below towering rock formations. Magili Cavern is located in the Noravank Gorge, close to Areni. One and half kilometers deep, the cavern was inhabited as far back as the Neolithic period. Stone tools and artifacts have been discovered in the cave, as well as more �recent� ceramic fragments from the 9th c forward. Because of its depth, Magili cavern holds a constant temperature of 14 degrees centigrade (58 degrees Fahrenheit). The passageway varies from just enough for a person to crawl through to a spacious 10-15 meters in width. Magili is also a unique underground eco-system, home to thousands of Microchiroptera Desmodus, Diphylla, Diaemus, otherwise known as fruit bats. The only mammal capable of true flight, bats are an important part of the ecological system. One of nature�s spectacles is at dusk, as the nesting bats fly out of the cave in a fluttering cloud that twists and turns in the evening air. Free style camping can be made in the river canyon near an ancient apricot forest near a hankayin akhpur (a mineral spring). About 4 hours hike from Magili, near Arpi, is the mammoth Archeri or Bear�s Cave. The entrance is located 1660 meters above sea level, and requires repelling to get to the entrance. The cave is more than 3 kilometers deep, with some of the most spectacular stalactites and stalagmite formations in Europe. Formed by thousands of years of calcite deposits dripping from ground water, the formations and varieties of colors are stunning. The water that is dripping now to form these formations is probably more than a hundred years old, filtering from the top of the mountain through layers of granite, slag and tuf to the cavern chamber. The formations glow under flashlight, some pure white, others as translucent as smoky glass, still others gold and red in color. Just past Arpi is Jerovank, the "water church". The �church� is actually a cave with a pool of spring fed water outside eh entrance. Inside are a series of stalactites that were used as part of 4th millennium BC worship. Directly in front of the cave entrance is a sacrificial stone, and the stalactites inside were used as phalluses for fertility rituals. Spelunkers and archeologists found human skeletal remains inside the cave, confirming speculation that early rites included human sacrifice. The canyon outside the cave is thickly forested and a hiker�s paradise. Nearby are the 11th c. Agaragadzor Kamourch and a large spring fed pool, a perfect place to swim in and cool of after a lengthy hike.